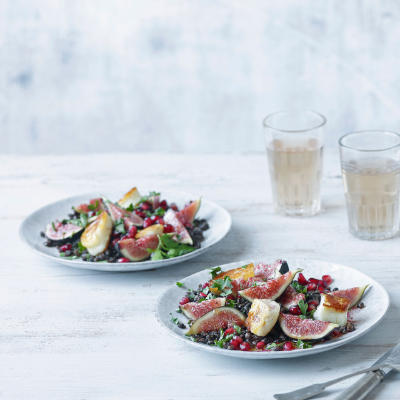 Add some colour to your winter table with quick and easy to pull together salad. 1. To make the dressing, whizz ½ the pomegranate seeds in a blender, then strain through a sieve into a bowl; discard the pulp. Add the lemon juice, honey, cumin and 3 tbsp oil and combine using a small whisk. Season and whisk again. 2. Put the lentils in a serving bowl with the remaining pomegranate seeds, the figs and parsley. Add the dressing and stir to combine. 3. Put a frying pan over a medium heat and add the remaining 1 tbsp oil and the halloumi. Cook the cubes for about 1 minute on each side, turning with tongs until golden and crisp all over. Tip into the salad and toss to mix. Serve straight away.